There are a handful of promising venues for reducing global emissions, one of which is energy efficiency. Much of the appeal of energy efficiency is that, in addition to enabling emissions reductions, finding ways to do more with less energy also has economic benefits. However, “efficiency” is a hard concept to quantify, given the fact that it is by nature a change in status quo as opposed to a tangible source of emissions. That is, there is no efficiency sector (such as the power generation sector) that emits a certain amount of greenhouse gas per year. It is instead a matter of negative space: determining what future emissions can be “unemitted” by preemptively employing efficiency measures. In order to address such an intractable issue, it is easier to look at subsectors, such as buildings and industry, which do have quantifiable yearly emissions that can be lessened through efficiency measures. Another area for potential emissions reductions, though not as easy to define, is the benefit of smart grid technology. According to McKinsey’s Climate Desk tool, buildings and industry make up over half of global emissions. (This considers end use emissions, where the emissions associated with energy production are linked to the sector that consumes the energy.) The building sector’s current emissions total 9.4 GtCO2e/year. This is concentrated mostly in China, the US, and the EU. The industry sector produces even more: 15.6 GtCO2e/year, with China responsible for 6.9 of this. The emissions abatement potential of these sectors is also a significant portion of the global abatement. At just over one-third of all the abatement potential, these solutions are critical to realizing success in reduction global emissions. 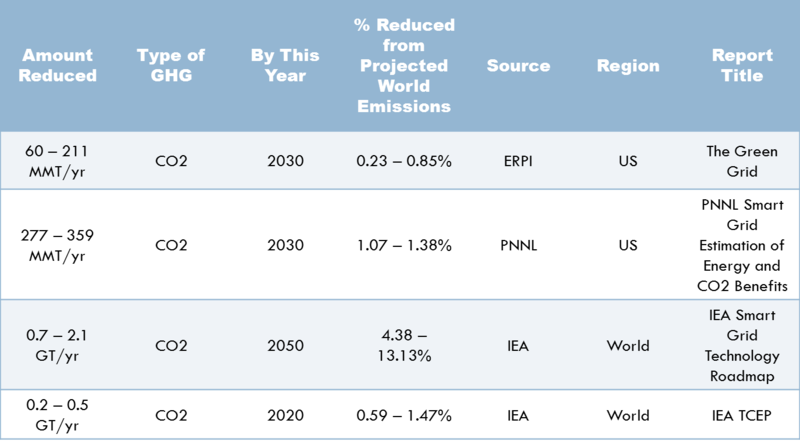 The Climate Desk suggests possible reductions by 2030. For buildings this is 3 GtCO2e/year, again with China, the US, and the EU leading the way. Industry is even more promising with a 6.9 GtCO2e/year potential. Once again, over half of this potential is in China. Finally, smart grid technology has great promise as a way to facilitate more conservative use, more efficient distribution, and therefore more controlled and predictable production. The smart grid is not a “sector” that can be quantified for current emissions. However, the emissions reduction potential can be evaluated through studies, many of which are ongoing. Based on current research, it is feasible that smart grid in the US could result in a 300 MGtCO2e/year abatement, while worldwide this could be as much as 2 GtCO2e/year. In total, then, there is a potential for 12 GtCO2e/year emissions reductions by considering only energy efficiency in buildings, industry, and through smart grid technology. Energy efficiency is not just a popular fad, it is a very real opportunity for abatement potential that should be avidly pursued.